A faint Iridium flare seen through cloud (click to embiggen). Practising for tomorrows -8 flare and NanoSail-D pass. The the Earth-orbiting Solar Sail NanoSail-D has finally moved into evening skies as seen from Australia. Generally NanoSail -D is quite faint, but (at least from Adelaide), there are quite bright passes on March 1 and 2. As well, NanoSail-D's highly reflective solar sail can catch the Sun's rays and the satellite appear to flare brilliantly. So it is well worth watching out for. As well, don't forget the cometeition. NASA and Spaceweather.com are staging a photo contest. Cash prizes ranging from $100 to $500 are being offered for best images of NanoSail-D submitted between now and the time the sail disintegrates. High-resolution telescopic images of the spacecraft, wide-angle shots of NanoSail-D soaring overhead, and lucky-shots of flares are all eligible. Visit nanosail.org for details of the competition. 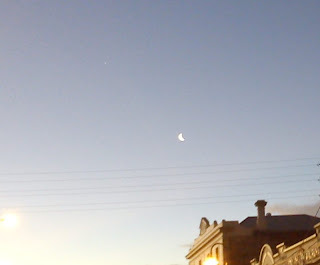 Morning sky looking east as seen from Adelaide at 5:00 am daylight saving time on Tuesday March 1 showing Venus near the crescent Moon. Similar views will be seen elsewhere at the equivalent local time. Click to embiggen. Just a reminder that Venus will be close to the 14% illuminated crescent Moon on the morninig of Tuesday March 1. This will be good to view from about 1 and a half hours before sunrise to deep into the twilight. You may even use this as an opportunity to see Venus in Daylight. Walking home I caught this 22° halo around the Sun. These occur when sunlight is refracted through hexagonal ice crystal high in the atmosphere. It is one of the commonest sky phenomena there is. I've seen quite a few around the Moon, but this is only the second I've seen around the Sun. There is also a tangent arc, which is my first one of them. Just shows what happens when you keep your eyes open. Here is a few images I've made of halos around the Moon. Now, although I’m a geek and love nifty programs and clever devices, I’m a bit of a luddite when it comes to mobile phones. I want my phone to be a phone. With the exception of the camera in my mobile phone, I find all the extraneous gewgaws of modern mobiles just plain annoying. Even the promise of listening to all the science and astronomy podcasts of the radio shows I miss on my phone has failed to move me. Then, on a recent trip, as I was handing my mobile over to EldestOne for him to make a call, the screen died. The phone was still working, but you just couldn’t see anything. So I was forced to shudder upgrade. I couldn’t get the equivalent of the old mobile I loved, so I got a phone with a 5 megapixel camera (Yayy! But that’s another post), and the Android operating system (this was by far the least fancy phone I could get). So yeah, I be can just like an iPhone owner and download heaps of “Apps”. Yeah great. Until recently, the major effect of this was that now EldestOne borrows my phone all the time to play “Angry Birds”. The I discovered “Heavens Above” for the Mobile. I love this app to bits, it’s an app version of the web-based satellite alert system that I use (along with Cal Sky) for locating and watching satellite passes and flares. Once you have changed it from its default setting of magnitude 8 for satellite passes (!!!!!) to something more sensible, it is perfect. In the Bad Old Days ™ , I would check “Heavens Above” on the home computer, set up an alert in the electronic diary, and check the star maps. Then, on the night (if I remembered to check the ED for events), I’d recheck the star maps, write down the flare/pass time on a slip of paper, collect the camera and my bushwalking GPS, then head outside and set the camera up. For flares, timing is critical as they only last about 10-15 seconds for maximum brightness, so I needed the GPS with its accurate clock showing seconds. Unfortunately, the clock display was tiny, so I occasionally missed a flare while peering at the clock. With the “Heavens Above” app, I can check encounters anywhere, the app beeps me before a significant pass, I still need to gather up my camera and phone, but the app has an inbuilt directional compass and altitude listing so I can line the camera up with the compass. And it has a reasonably readable countdown timer (could be bigger, but works for me) with accurate seconds, so timing flares is a snap. There are two annoyances, one big, one small. The big annoyance is that the automatic time zone detection doesn’t work on my phone, whether I set the phones time zone manually or get it automatically set from the network. The app lets you set a time zone manually, but it doesn’t have a +10:30 time zone that I need for daylight saving time here in Adelaide. Luckily I can do maths, and the count down time counts up as well so adding an hour is no problem. The minor annoyance is that the app currently doesn’t do NanoSail-D. The other app is Google SkyMap (which annoyingly subsumes the name of my workhorse planetarium program SkyMap). Now, I know what the sky looks like, so while it is cute to point your phone at the sky and see the constellations above mirrored therein it’s not much help to a seasoned amateur. If you are just starting out, or want to help people starting out, it’s very helpful though. But what I do use if for is finding Venus in the daylight. Usually, when looking for daylight Venus I use its proximity to the Moon when the two are close, or establish its predawn location against a landmark. With Google SkyMap I can now find it anywhere (did so this morning). You have to get used to the fact that (in my phone at least) an object centred in the screen is just off the top left of the phone when held at arms length. Once you have the relative location of objects to your phone worked out, finding Venus in the daytime is a snap. I also used it to show my colleagues the daytime Moon. There are a lot more astronomy apps, but that’s a post for another day. Via the Bad Astronomer and Will Gater, an astonishingly detailed map of the Moon made of a mosaic of images from the Lunar Reconnaissance Orbiter, with a zoomable web browser. Carnival of Space #185 is here (for real this time). Carnival of Space #185 is now up at The Space Writers Ramblings (I put last weeks #184 as #185). There's alien biology, water in space, low cost space habitats, possible planets lurking in the Oort cloud, the temple 1 comet encounter and much, much more. Ramble over and have a read. Christchurch has suffered a devastating earthquake. We wish everyone one their all our best wishes, and hope their loved-ones are found safe. If you want to donate money to help out, try donating via the Salvation Army. Australians worried about friends and relatives should ring the DFAT hot-line 1300 555 135. More details about how you can help are here. And No, One in Two Stars Do NOT Have an Earth-Like Planet Around Them. The headlines in the Telegraph said "Alien life boost after Nasa finds one in two Suns has Earth like planets" and the Adelaide Advertiser said "One in Two Stars may Support Life" (page 22 of Tuesdays edition). They have discovered the Kepler planet bonanza (somewhat late). But, no, sorry. They have mangled the quite reasonable statement that one in every two sun-like stars may have planets per se by conflating planets with Earth-like planets (and Earth-like planets in the habitable zone). Only 54 of the 1200+ planets detected by Kepler were found to be in their stars habitable zone, and of those only two were roughly Earth mass (and a couple of Super Earths like KOI 702.03, visualized above) . There may be a lot more Earth-like planets out there, but not 50% of them having Earth-like worlds based on present data. Exoplanets visualized at "Data is Beautiful" for Wired. I have previously pointed you at some amazing visualizations of the Kepler Exoplanet data. 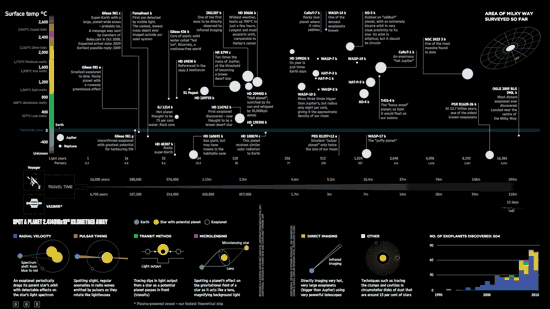 My friend Stuart has just alerted me to a stunning visualization at "Data is Beautiful", showing some of the most interesting and important exoplanets. The post also shows the step by step process of taking the data and building an infographic out of it, which is in itself ineteresting. A truly amazing piece of work (and one of my posts is referenced in it) and they make the spreadsheet they used to build the exoplanet graphic available to all. The Last Quarter Moon is Friday February 25. Jupiter is seen very low in the evening twilight sky. Venus is visible in the morning sky in the constellation of Sagittarius. The Moon visits Venus on March 1. Saturn is well placed for telescopic observation. Globe-at-Night light pollution Survey. The Last Quarter Moon is Friday February 25. Bright white Venus is readily seen in the early morning sky below the handle of the "Teapot" of Sagittarius. Venus is "gibbous" phase, and will progressively become more full (and smaller) over the coming weeks. 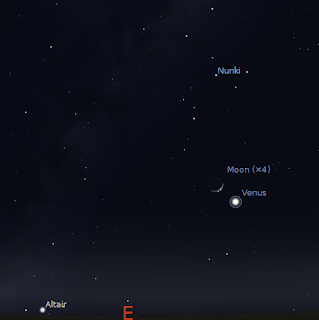 On the 1st Venus is very close to the thin crescent Moon. Mercury is lost to the twilight. 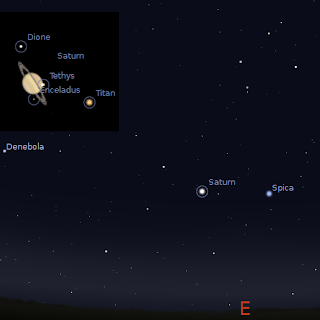 Evening sky on February 26 looking east as seen from Adelaide at 11:00 pm daylight saving time in South Australia showing Saturn near Spica. Similar views will be seen elsewhere at the equivalent local time. 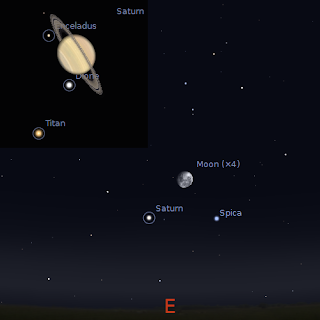 Inset, the telescopic view of Saturn on the 3rd (and on the morning of the 4th), you will need a fairly large telescope to see any moon other than Titan. Click to embiggen. Saturn is rising well before midnight, and is high enough for telescopic observation in the late evening, although it is best seen in the early morning. It readily visible not far from the bright star Spica. The big storm on Saturn is now so large that it is visible in even small telescopes. Even in small telescopes you can see Saturn's rings and it's moon Titan. Titan is close to Saturn on the 3rd. The asteroid Vesta is quite faint (magnitude 7.8), so you need binoculars to see it and may need to watch over a number of nights to make sure you are seeing it. However, on the 24th it is almost on top of the cluster Cr 394 (see printable PDF map here). You will need to get up a bit before 5:00 am local daylight saving time when the sky is still very dark. You will also need good, steady binoculars or a small telescope, and to make sure your eyes are dark adapted, in order to see Vesta, but it will be worthwhile. 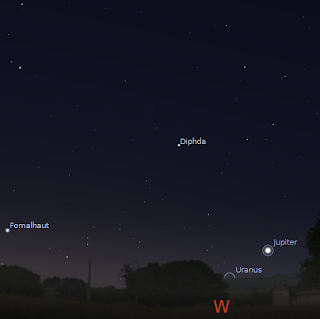 Evening sky looking west showing Jupiter at 8:30 pm local daylight saving time on Saturday February 26. Click to embiggen. Jupiter is becoming difficult to see, setting in the late twilight. Jupiter is above the north-western horizon, setting around 10:00 pm daylight saving time. Jupiter is too close to the horizon for good telescopic views (apparently the southern equatorial belt is back). The Globe at Night global light pollution survey is open to all people, whever they live. This year the survey is from 21 February to 6 March (starting tonight). The evening sky around 10:00 pm daylight saving time in February in Australia. It's now 6 years since the Globe at Night started surveying light pollution around the world. This year the survey is from 21 February to 6 March (starting tonight). Everyone can be involved, hopefully students and teachers too. Basically, an hour after sunset head out, look to the west to find Orion, then check how many stars are visible, and report your observations. It's a great excuse to get outdoors and look at the sky. You might even see the International Space Station or an Iridium flare or NanoSail-D.
Left Image: Tarantula Nebula imaged using GRAS 14 instrument at Global Rent a Scope with 3 x 120 sec Red filter FITS images, 3 x 120 sec Green filter FITS images and 3 x 120 sec Blue filter FITS images. Each series of individual filter runs stacked using in Image J using Z projection of maximum intensity, then stacked and assembled into a RGB composite using ImageJ. Right Image: Single 120 sec RGB filter FITS images stretched using FITS liberator and ArcSinh(x) stretch. Stretched files stacked and assembled into a RGB composite using ImageJ. 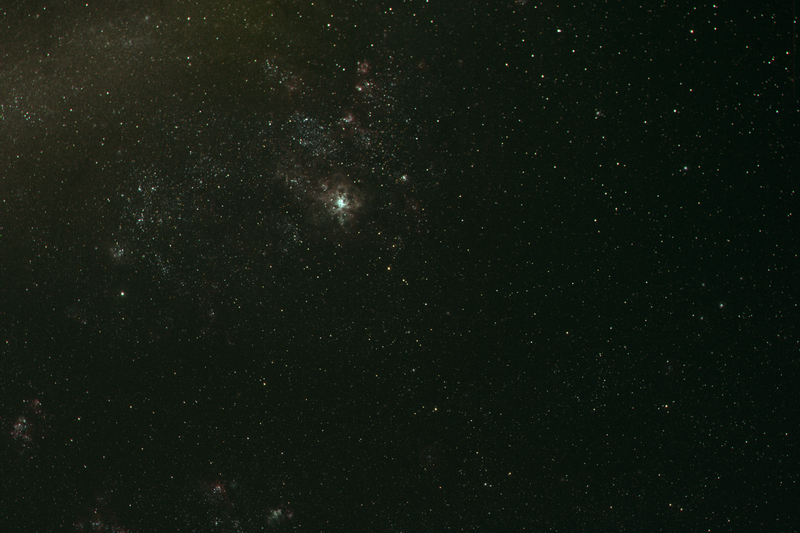 These are smaller frames of the nebula cropped form the whole image. You really, really need to click on these images and embiggen them (and compare to this APOD image which is 31 hours of exposure). As people know, I'm a fan of low cost astroimaging. For GRAS remote telescope images, my workhorse is the freeware ImageJ. This works pretty well, especially for stacking and aligning images. However, astronomical images can have a large dynamic range from the very faint to the almost overexposed. How to bring out faint structure without turning the bright sections into glaring blobs. This is where FITSLiberator comes in, it's a freeware app (also there are photoshop plugins), which makes it very easy to adjust the dynamic range of your images for later assembly in other image processing programs (You can do something similar in ImageJ but it's not as easy). As you can see above, with FITS liberator I was able to adjust the dynamic range of my Tarantula Nebula images to almost match the brightness of the multi-stacked images, without the central regions getting overexposed or the background being over-coloured. 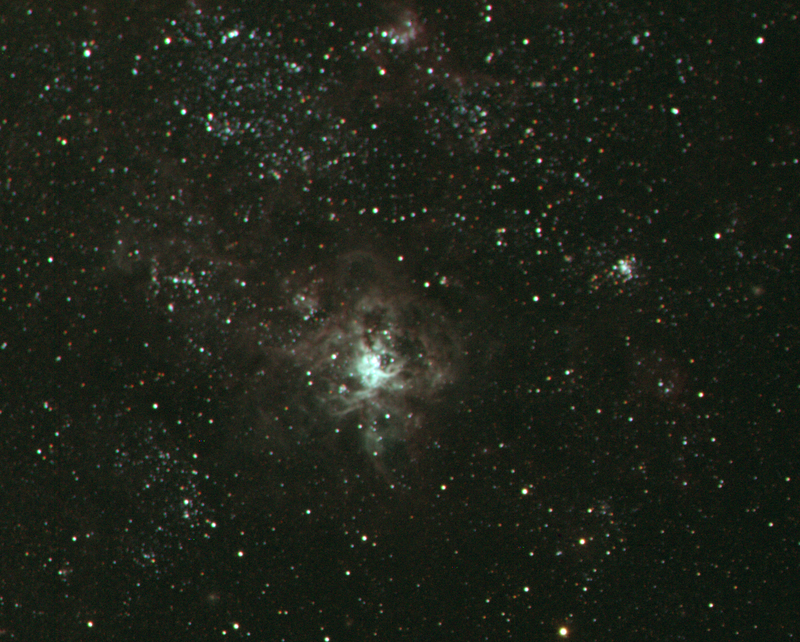 Obviously my Tarantula Nebula won't win the astrophotography contest, and I still have a lot to learn, but I'm going to get a lot more out of my images now. The FITS Liberator website comes with links to a whole range of Hubble raw images, and step by step instructions so you can create your own version of classic Hubble pictures. The PDF user manual is here. Aurora Alert 17 Feb! Geomagnetic Storm on Now! A Geomagnetic storm is on NOW! Unfortunately, it's still broad daylight in those areas not covered by cloud. You can follow the storms progress at IPS Space Weather. With any luck it will hold out so people in Tasmania and Southern New Zealand can see something. UPDATE: Meh, Kp index just dropped back to 4, more storms may occur so keep an eye on the IPS site. It was inevitable, after the British newspaper The Independent overhyped some researchers claims about the possible existence of a jovian (or larger) mass planet out in the Oort belt, some Nibiru folks have jumped on this. The Bad Astronomer has already dealt with the likelihood of there actually being a planet out there, so I won't go into any detail. 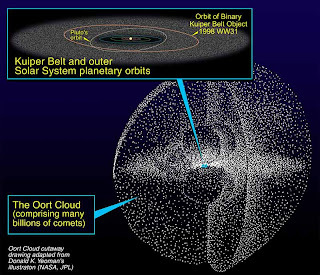 Just to briefly recap though, statistical analysis of long term comets suggested (with marginal statistical significance), more comets were bring ejected from the Oort cloud in the plane of the ecliptic than elsewhere, and the researchers hypothesised that there was a Jovian (1-4 Mjup) mass planet disturbing the Oort cloud. You can read their latest paper here. The take home message from this paper is that, should Tyche exist (the proposed name for the planet should it in fact exist), is that it is, at its closest 2,000 au from the Sun. Depending on the mass of course, the bigger the planet is, the further it is from the Sun to produce the effects seen. A 5 MJup planet would have to be 6,000 au away (roughly 1/10 of a light year). 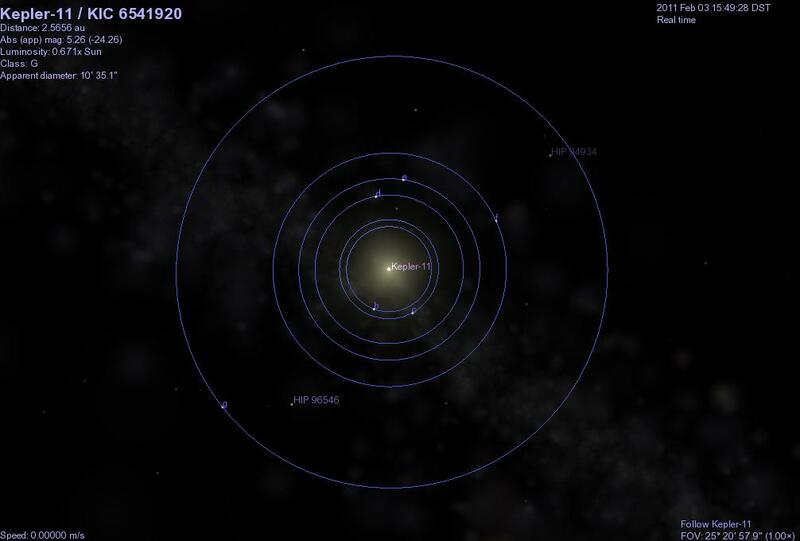 To give a feel for this scale of this distance, Pluto is roughly 40 au away, Eris (Xena) at its most distant is roughly 98 au away and Sedna at its most distant is 960 au away (currently it is a mere 90 au away). That's a loooonnnng, long way way (nearly a light month at 2,000 au, over a light month at 6,000 au). 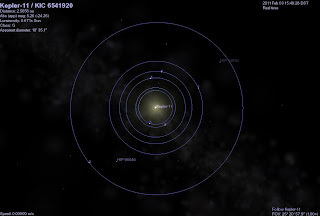 Very simply, if Tyche does exist it's not going to turn up in the inner solar system in 2012 (and it is not Nibiru). Of course, it is not clear that the Nibiru folks are conflating Tyche and Nibiru, they might just be claiming that the possible existence of Tyche justifies the possible existence of Nibiru, but when you have people getting all flustered about a 22 ° halo, it's hard to know what they think. But then again, the paper helps out there, the authors have searched the IRAS archives extensively, and they conclude there is no 1-4MJup planets out to 2,000 au, so Nibiru is not out there. Of course, instead of jumping at and down at the latest press release, or images of haloes, the Nibiru folks could have been actually looking for themselves. The IRAS archives are publicly available, there are heaps of remote telescopes that you can buy time on to serach with and of course, most decent amateur scopes would be able to pick out a Mjup planet at Pluto's distance, so there are many avenues for searching. And if Nibiru is going to be in the inner solar system in 2012, then they have a good idea where to look. So why aren't they looking for real? The indigenous people of Australia had a rich lore associated with the sky, only fragments of which remain. To the Boorong people of Victoria, the Saucepan of Orion's belt is a group of young men dancing (Kulkunbulla) to music played buy a group of young women (Larnankurrk) represented by the Pleaides (the small cluster off to the left). Gellarlec, the rose coloured Cockatoo (Aldebaran) sings and beats time. To the east, the twins Yurree and Wanjel (Castor and Pollux) hunt Purra the Kangaroo. To the Karuna people of the Adelaide Plains, Orion's belt was the Hunter Tinniinyarra, to the Yonglu people, Orion was a canoe with three men fishing. As you can see, some of the indigenous Australian constellations were similar to those of the Greco-roman constellations westerners are familiar with, while others are quite different. The sting of Scorpius the Scorpion is variously the head of Ingalpir, the crocodile, Karick Karick a pair of hawks or a fringe of feathers around the wings of dark constellation the Emu. This underlines the fact that constellations are human constructions (a Gellarlec zodiacal constellation would be cool though, with all those stubborn, steadfast Taureans finding they should be garrulous, flighty and given to chewing things). Aboriginal sky lore went beyond constellations and their associated stories though. Listening to ABC radio national two week ends ago, I learnt of the stone circle Wurdi Youang in Victoria, an egg shaped stone arrangement built by the Wathaurung people. It is aligned east-west, with groups of stones indicating the setting position of the Sun at solstices and equinoxes. We know that indigenous Australians were acute observers of the natural world, but this is the first physical evidence we have of the detailed attention they gave to the sky. The site has been compared to Stonehenge, in terms of it's significance in our understanding of Indigenous Australians relationship to the sky. While not on the same scale as Stonehenge, the organisation required to move these stones in place would have been considerable. This ring also strikes at the myth that indigenous Australian built no permanent structures, and extends the list of things they did build (from aquaculture dams to stone huts). Actually determining the locations to place the stones would have been relatively easy for long term sky observers, with access to sticks and string. Unfortunately, we have lost a lot of the indigenous lore about the sky, and with it the significance of the ring to the local peoples. In the light of all that indigenous Australians have lost, this may seem a small thing, but the skies are a shared heritage, and a source of wonder for all. We are all diminished by this loss. 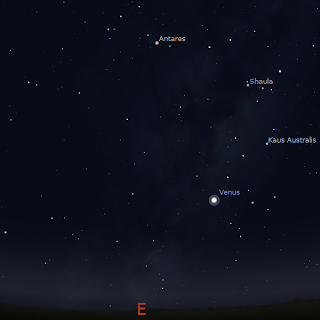 Venus close to Zeta Sagittarii on the morning of 16 February at 5:00 am ACDST. Click to embiggen. Comet Temple 1 imaged at closest approach by the Stardust spacecraft. 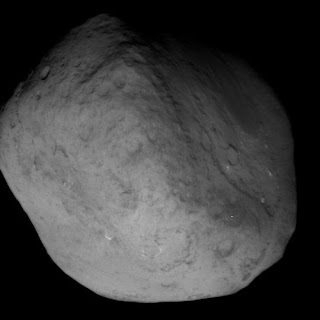 The full image sequence, including the close approach images, from the Stardust encounter with comet Temple 1 is now up at the NASA web site. There is a wealth of data in these images (as well as them being quite pretty in their won right. We now have views of terrain not seen by the Deep-Impact mission, views of the impact crater made by the Deep-Impact impactor, and possibly more importantly, changes to the comet structure since the comet was visited by Deep-Impact. 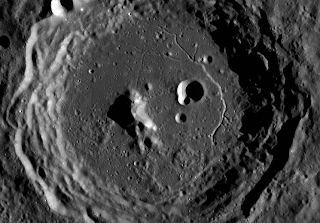 The smooth terrain observed by Deep-Impact has visibly eroded in the images taken by Stardust. As always, the Bad Astronomer has a nice summing up. And the Australian ABC's StarStuff has an excellent Podcast on the encounter (amongst other things). First image in the Temple 1 approach sequence. 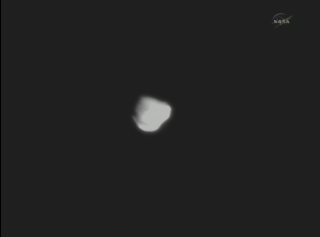 The first Temple 1 images are through, however, due to a command glitch, it may take 6 hours to see closest approach images. UPDATE: Images are now appearing at http://www.jpl.nasa.gov/news/stardust/ but it will be hours before the closest approach images appear. (the bottom image was taken one minute after the first, and it's the most recent download as I write). Stardust Meets up with Comet Temple 1 Shortly, Watch It Live. The Stardust spacecraft will rendezvous with comet Temple 1 in a few hours time. NASA TV will start broadcasting the encounter around 8:30pm (14th) US Pacific Standard Time, which is Tuesday, 15 February 2011 at 04:30:00 UT and is roughly 3:30-4:00 pm on the 15th here in Australia, with the encounter around 5:30 pm. UPDATE: The spacecraft successfully passed the comet, surviving the flyby (despite taking a hit), and taking an image very 6 seconds. The images should be available around 6:00 pm Australian time (Midnight US PST). UPDATE 2: Data is downloading now. Sunspot group 1158 has fired off an M Class flare. This is the first flare of any size headed towards Earth in a long time. Sunspot group 1158 has been bubbling along for a while, and fired off another M class flare this morning. The Coronal Mass Ejection (CME) from the first flare should hit sometime between February 15 and 16, people in high latitudes (eg Tasmania and Southern New Zealand) should be on the look out for aurora. However, the Australian IPS has not yet issued a geomagnetic alert, so it might be a fizzer from the Southern hemisphere. Aurora can occur anytime, but it is often best to look after midnight. However, due to the complexities of the interaction between the CME and the Earths magnetic field, a CME strike is not guaranteed to produce an aurora. UPDATE: 1158 Just blasted out an X1 class flare, not sure if it was Earth directed though. The Full Moon is Friday February 18. 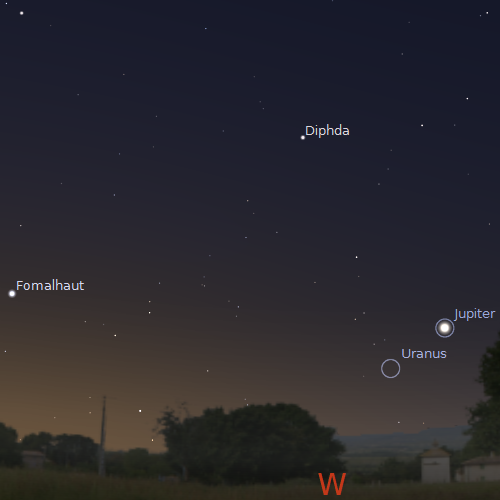 Jupiter is seen low in the early evening sky. Venus is visible in the morning sky in the constellation of Sagittarius. 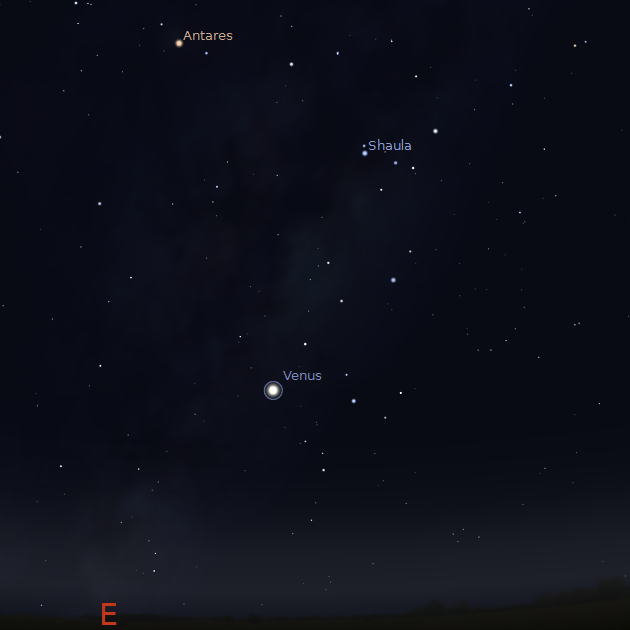 Venus comes close to some moderately bright stars during the week. Saturn is well placed for telescopic observation, and is visited by the Moon on the 21st. Vesta near clusters. NanoSail-D photography competition. Morning sky looking east as seen from Adelaide at 5:00 am daylight saving time on Saturday February 19 showing Venus near Sagittarius. Similar views will be seen elsewhere at the equivalent local time. Click to embiggen. The Full Moon is Friday February 18. Bright white Venus is readily seen in the early morning sky near the handle of the "Teapot" of Sagittarius. On the 16th Venus is Very close to the star zeta2 Sagittarii in the handle of the "teapot", and on the 19th it is very close to the star pi Sagittarii. You may need binoculars to see the two apart. Morning sky on February 21 looking east as seen from Adelaide at 11:00 pm daylight saving time in South Australia showing Saturn near Spica. Similar views will be seen elsewhere at the equivalent local time. Inset, the telescopic view of Saturn on the 21st (and on the morning of the 22nd), you will need a fairly large telescope to see any moon other than titan. Click to embiggen. Saturn is rising before midnight, but it is high enough for telescopic observation in the early morning. It readily visible above the northern horizon, not far from the bright star Spica. 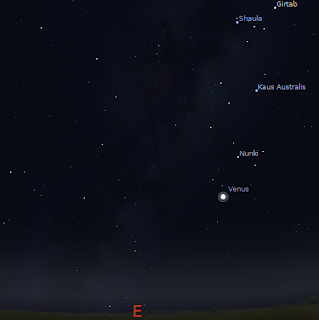 On the evening of the 21st (and the morning of the 22nd) the waning Moon forms a triangle with Spica and Saturn. Even in small telescopes you can see Saturn's rings and it's moon Titan. Over the week Titan draws close to Saturn. The asteroid Vesta is quite faint (magnitude 7.8), so you need binoculars to see it and may need to watch over a number of nights to make sure you are seeing it. However, between the 16th to the 2nd Vesta in between Scorpius and Sagittarius and passes between the globular cluster M22 and the open cluster M25 in the morning sky. On the 23rd it is almost on top of the cluster Cr 394 (see printable PDF map here). You will need to get up a bit before 5:00 am local daylight saving time when the sky is still very dark. You will also need good, steady binoculars or a small telescope, and to make sure your eyes are dark adapted, in order to see Vesta, but it will be worthwhile. 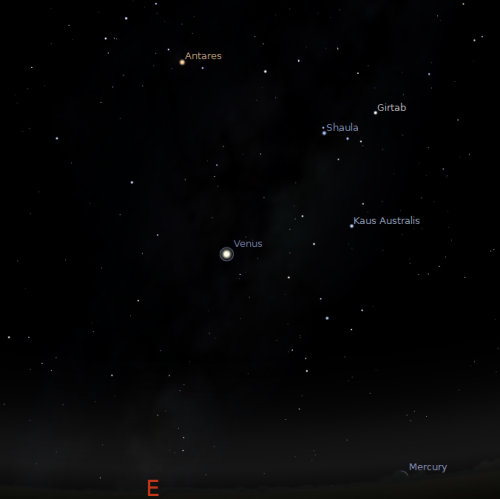 Evening sky looking west showing Jupiter and Uranus at 9:00 pm local daylight saving time on Saturday February 19. Click to embiggen. Jupiter can be readily seen from twilight until it sets in the early evening. Jupiter is above the north-western horizon, setting around 10:00 pm daylight saving time. Jupiter is too close to the horizon for good telescopic views (apparently the southern equatorial belt is back), but its moons are excellent in binoculars. 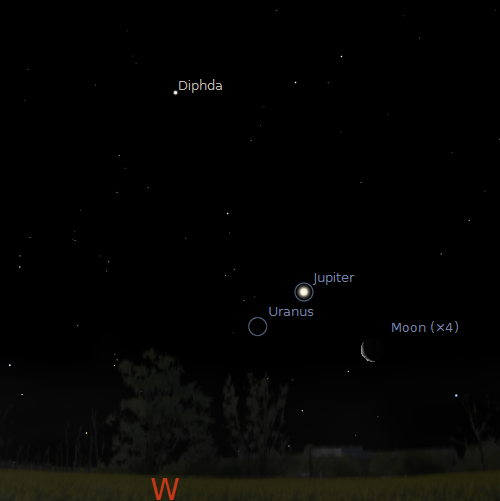 As Jupiter sets fairly early, there are limited opportunities to see cool Jupiter Moon events (scroll down until you hit Jupiter), but it's worth having a look anyway. AS I noted last week, NASA is holding a competition for images of the Solar Sail satellite NanoSail-D, descriptions of the competition and and details of how to find the satellite are at the NanoSail-D photography competition link. Congratulations to Rob McNaught, who has just found his 58th comet. C/2011 C1 is going to be a bright comet reaching a sparkly magnitude 12, i.e. not visible except in decent telescopes). Images of the comet can be found here and here. The SA branch of the Australian Science Communicators is putting on a Speed Networking Event on Tuesday February 15, it should be great fun, so come along! Stardust and Comet Temple 1, Again (February 14). The revamped Stardust spacecraft will meet up with comet Temple 1, on 14th February (Valentines day) in some time zones (it's not clear, but it may be the morning of the 15th here is Australia). The spacecraft will revisits the comet six years after Deep Impact visited the comet and dropped a projectile on it. 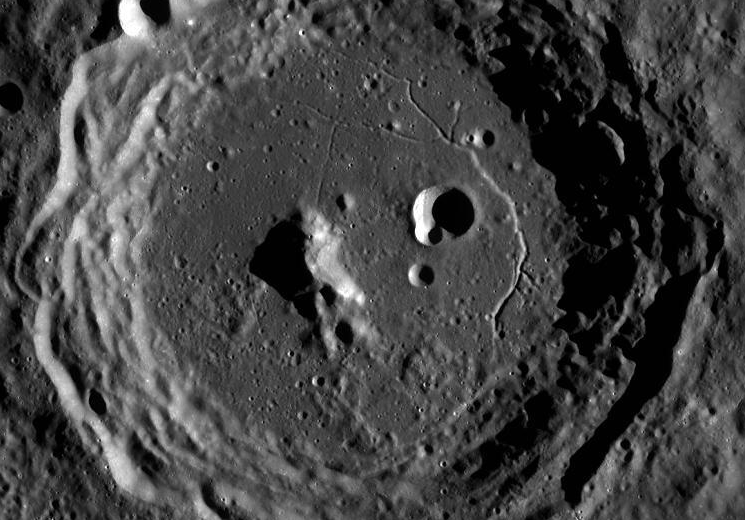 This visit will show how the comet has evolved since then and get a look at the Deep Impact crater. Don't know if they will broadcast it live though. Carnival of Space #185 is here (Valentines Day Edition). Carnival of Space #185 is now live at Colony Worlds. It's a special Valentines Day edition, and everything is in verse. It's geekadellically awesome, head on over and have a read. Left hand image: Venus in Sagittarius at 5:00 am, local daylight saving time, above the eastern horizon. Right hand image: Approximate binocular view showing Venus near M22 and M25 (the stars are not going to be that bright, unless you are well away from city lights, have dark adapted your eyes for some time and have really good binoculars). Click on images to embiggen. Just a reminder that on the morning of Saturday February 12 Venus passes between the globular cluster M22 and the open cluster M25. This will look very nice in binoculars in the early morning before twilight starts. If you look around 5:00 am (local daylight saving time), this will be before astronomical twilight, when the sky is quite dark, and Venus and the clusters should be high enough that horizon murk will not interfere as much. Do remember to take some time to dark adapt your eyes. 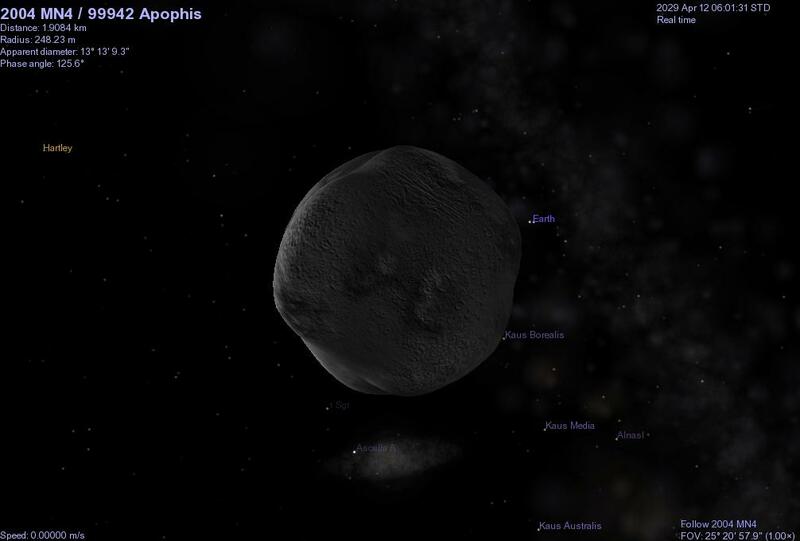 Asteroid 99942 Apophis visualised in Celestia. 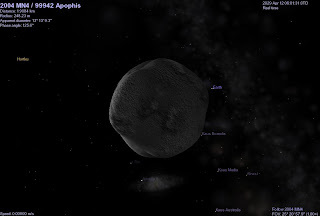 The asteroid 99942 Apophis (2004 MN4) is in the news again. The Bad Astronomer has already railed about the media mangling of the research on this asteroid, absurdly over-hyping the minuscule probability that the asteroid will hit us in 2036. Since the BA has already dealt with these issues, and there is no way I can improve on his excellent writing, I'm giving you an updated Celestia file for 99942 Apophis instead. The elements are taken from the latest MPEC data, BUT .... it doesn't come close to Earth on 13 April 2029, as it should. I suspect something is wrong with the Mean Anomaly, as JPL Horizons, Wikipedia and MPEC all give different Mean Anomalies, by huge amounts (using the Wikipedia MA values give the closest approach of the bunch, around 0.113 AU). There's probably something highly obvious I'm missing, but have a play with it anyway. As allways, cut and paste the data below into a new file 2004MN4.ssc and copy the file 2004MN4.ssc into the Celestia extras folder. # Ian Musgrave February 10, 2011. Using orbital elements from MPEC from MPO 164109. 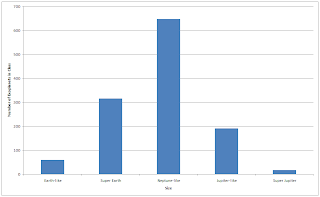 "2004 MN4:99942 Apophis " "Sol"
I've posted links to the data from the Kepler Extrasolar planet mission (now linked to in Wikipedia, I'm not worthy), data on over 1,200 extrasolar planets and their stars. My Excel graph was rather sucky, but Flowing Data has some stunning visualizations of the data, and a cool animation from Jer Thorp. Rush over there right away. Left image: Venus glows beneath the Scorpion in the early morning sky (Canon IXUS 100IS, 15 second exposure, ASA 400, click to embiggen). 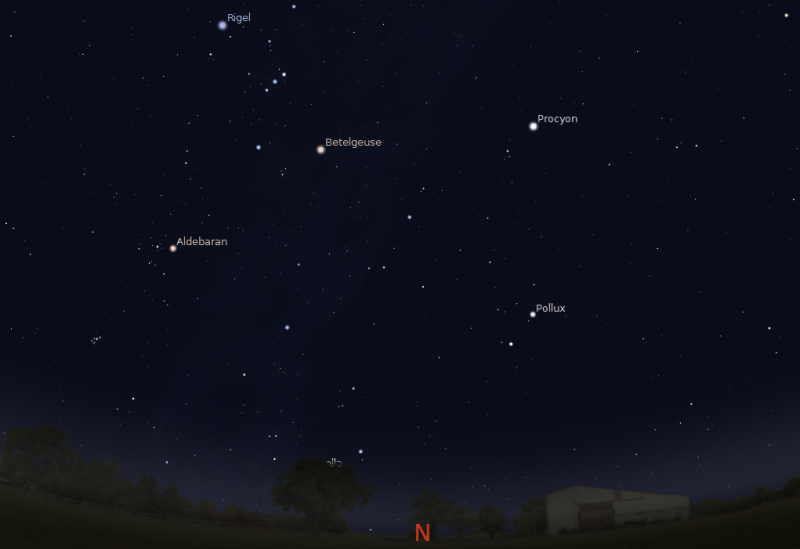 Right Image: Magnified view of the area, Vesta should be just between Venus and 21 Sagittarii (click to embiggen). Venus and the asteroid Vesta have been pretty close recently. At magnitude 7.8, Vesta should be visible in 10x50 binoculars, so I've been trying to get to see them over thepast two nights. Unfortunately, light pollution is pretty bad in that direction, and combined with the glare of Venus itself, I've been unable to pick it out. Still, the morning sky looks pretty good, and seeing Venus close to the beauties of the Sagittarius/Scorpius border is is justification enough for early rising. 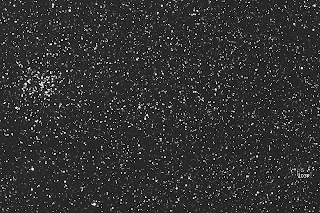 Comet 103P Hartley, now around magnitude 10.5, near the open cluster M50, you will definitely need to click to embiggen the image to see the faint fuzzy dot that is the comet. 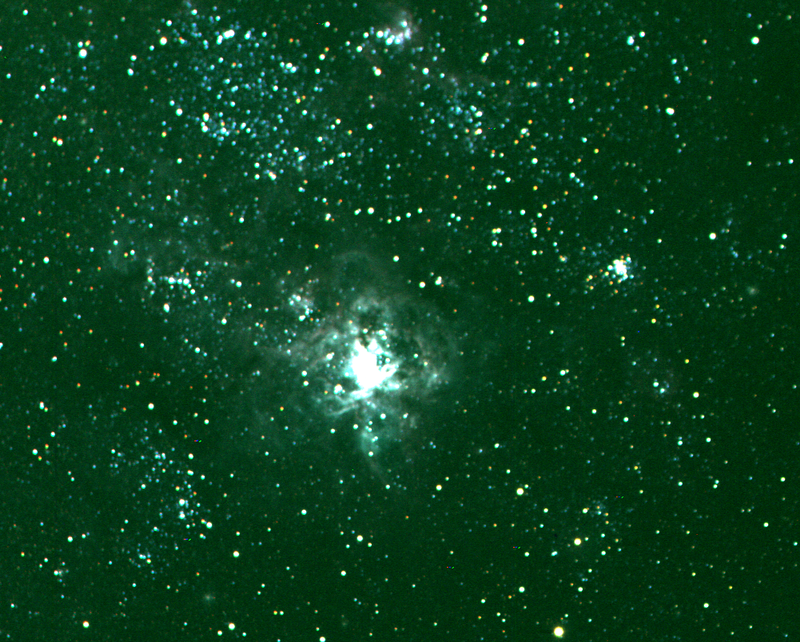 Image taken with the GRAS 14 instrument at Global Rent a Scope and 3 x 120 second luminance images stacked in Image J using Z projection of maximum intensity. Comet 103P Hartley is now much faded from it's glory days (see here for example). But it's been going through some interesting territory. Sadly, up until now when I have had time to image, the scopes have been clouded out or such, so I have missed a lot of interesting encounters. Congratulations to Dr. Christian Sasse, who has set the record for the farthest and faintest object an amateur has imaged. Using the newly commissioned global rent-a-scope GRAS-17 telescope, he imaged the quasar J1148+5251 the second most distant object ever observed This quasi stellar object has h a redshift of z=6.41, meaning its light has been traveling for around 13.7 12.8 billion years* to Earth. Read the full story (and see the images) here at the GRAS news site. The First Quarter Moon is Friday February 11. Jupiter is seen low in the early evening sky. Venus is visible in the morning sky in the constellation of Sagittarius. Venus comes close asteroid Vesta on the 9th and to some bright star clusters on February 12. Saturn is well placed for telescopic observation. NanoSail-D photography competition. Morning sky looking east as seen from Adelaide at 5:00 am daylight saving time on Saturday February 12 showing Venus near Sagittarius. Similar views will be seen elsewhere at the equivalent local time. Click to embiggen. The First Quarter Moon is Friday February 11. On the 9th, Venus is very close to the Asteroid Vesta (see printable PDF map here). Vesta is quite faint (magnitude 7), so you need binoculars and may need to watch over a number of nights to make sure you are seeing it. 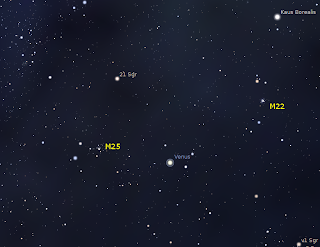 On the morning of Saturday February 12 Venus passes between the globular cluster M22 and the open cluster M25. This will look very nice in binoculars in the early morning before twilight starts. Mercury is difficult to see in the morning sky below Venus. You will need a fairly clear, level horizon to see Mercury and by the end of the week it is lost to the twilight. Morning sky on February 12 looking north as seen from Adelaide at 5:00 am daylight saving time in South Australia showing Saturn near Spica. Similar views will be seen elsewhere at the equivalent local time. Inset, the telescopic view of Saturn on the following day, you will need a fairly large telescope to see any moon other than titan. Click to embiggen. Saturn is rising before midnight, but it is high enough for telescopic observation in the early morning. It readily visible above the northern horizon, not far from the bright star Spica. You might be able too see the big storm on Saturn if your telescope is big enough. Evening sky looking west showing Jupiter and Uranus at 9:00 pm local daylight saving time on Saturday February 12. Click to embiggen. Jupiter can be readily seen from twilight until it sets in the early evening. Jupiter is above the north-western horizon, setting around 10:30 pm daylight saving time. Jupiter is too close to the horizon for good telescopic views, but its moons are excellent in binoculars. There are lots of opportunities to see cool Jupiter Moon events (scroll down until you hit Jupiter). NASA is holding a competition for images of the Solar Sail satellite NanoSail-D, descriptions of the copetition and and details of how to find the satellite are at the NanoSail-D photography competition link. Left image: The ISS passes Procyon (ASA 400, 15 secs exposure), Right Image: the ISS passes Sirius, ASA 200, 1 sec exposure (click to embiggen, you need to to get the detail). So, there I am, walking up towards the beach with the camera and tripod to take shots of Jupiter and the Moon, when I see the ISS rising into the sky. So I stand there appreciating it, then I realise that the ISS will pass between Orion and Sirius, pretty close to Sirius, so I try and set the camera up. First I get an under exposure, then I get an over exposure, but I did capture it. And year, it looked pretty cool too. Left image: Early evening, with the Moon and Jupiter above historic Semaphore, taken with my Mobile Phone. Right Image: mid twilight, the Moon and Jupiter sink towards the sea (click to embiggen). For the first time in a while the sky was not clouded out or raining, and it wasn't so hot the camera would melt if I tried to take pictures. The boys and I went to chess for the first time in ages, and afterwards, after middle one nearly defeated me in a long game, the Moon and jupiter were shining in the sky above us. I took a photo with my mobile phone, but I had to balance it on the roof of the car, not the best spot when kids are bouncing in said car. When we got home, I took the camera up to the breach, to get some shots of the pair setting over the water with a red-orange horizon. A most beautiful and peaceful scene. The 10:23 Challenge is a follow-up to the 'overdose' protest staged by the 10:23 Campaign in 2010. International protesters from more than 10 countries, and more than 23 cities will gather for over the weekend of February 5-6 2011, to make the simple statement: Homeopathy - There's Nothing In It. There's events in Australia (although it's probably too late, them being on the 5-6th) but there's lots of resources at the 10:23 site, so go have a look (oh, and read "the Australian Government Needs to Wise Up on Homeopathy"). ...on ABC local radio (Adelaide 891 AM) with Ashley Walsh, especially the first caller (Mark?) who was asking about stacking images for satellite and planetary movement, I've added in a link for all my posts on astrophotography, and especially using the GIMP for astrophotography. The GIMP link explains stacking, while the detail is for the GIMP program, it applies generally to most photo-manipulation programs. Southern Skywatch February 2011 edition is now up! The February edition of Southern Skywatch is now up. Sorry is late again, but with kids birthdays, visitors, heatwaves (the only room cool enough to work in was occupied by visitors and kiddies trying to sleep) and worrying about friends in the QLD cyclone got in the way. Venus has some interesting encounters with clusters, stars and the asteroid Vesta. Venus is now a gibbous shape in small telescopes and strong binoculars. Jupiter is well past opposition. 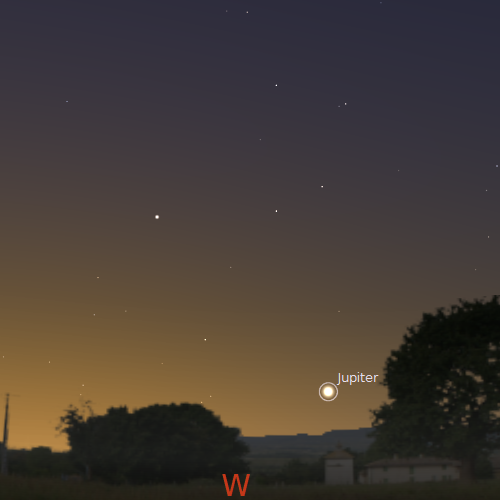 Jupiter is visible in the early evening sky just above the western horizon and sets around 11 pm. It is hard to get good telescopic views close to the horizon. However, Jupiter's Moons are still good to watch. 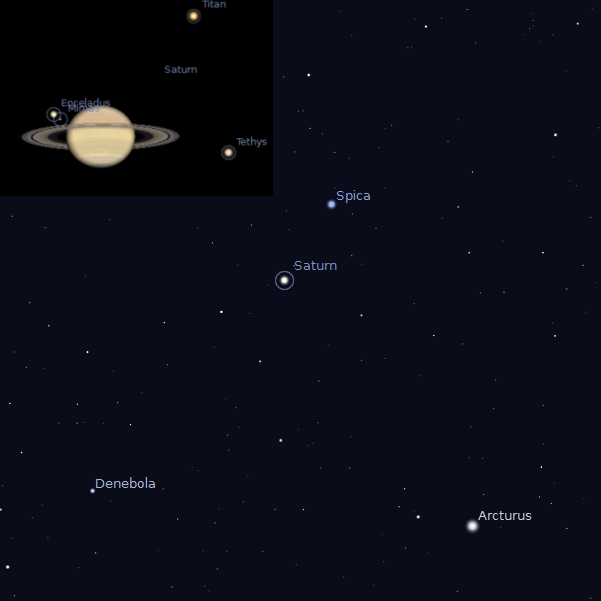 Saturn is now a good telescopic object in the morning, being high above the northern horizon. It is now rising before midnight. I'll be on ABC local radio (Adelaide 891 AM) with Ashley Walsh tomorrow (Sunday Feb 6th), going live about 11:40 am ACDST (they doing streaming, so even if you are not in Adelaide you can catch this on your computer). I'll be talking about the exoplanet bonanza, astrophotography and one or two other things if we get the time. Morning sky looking east as seen from Adelaide at 5:30 am daylight saving time on Saturday February 5 showing Venus, Mercury and the bright star Antares. Similar views will be seen elsewhere at the equivalent local time. Click to embiggen. Venus has some very interesting encounters over the next few days. First off and quite beautiful, tomorrow morning on Saturday the 5th, Venus is between the open cluster M23 and the Triffid nebula M20. This event is best seen with binoculars. However, because of the glare of Venus, you will probably need to move Venus out of the field of view to see M20 and M23 at their best. 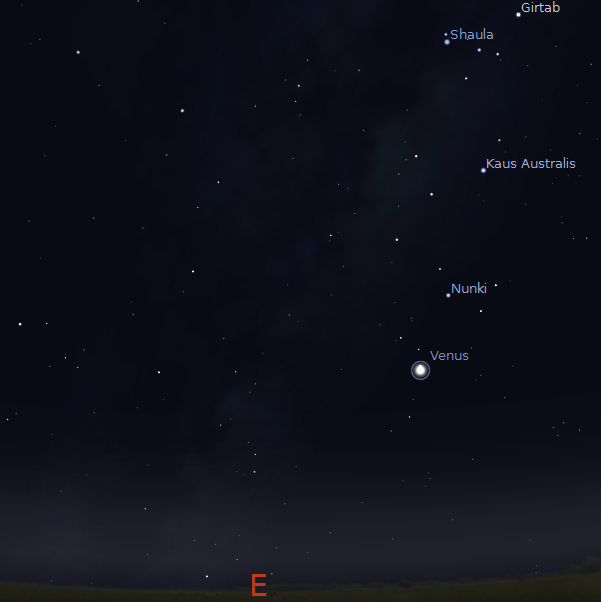 You will need to look between 5:00 am and 5:30 am local Australian daylight saving time when Venus and the clusters are high enough above the horizon but it is still dark enough fro the clusters not to be drowned out by the twilight. On the 7th and 8th Venus is very close to mu Sagittarii, the lid of the "teapot" of Sagittarius. 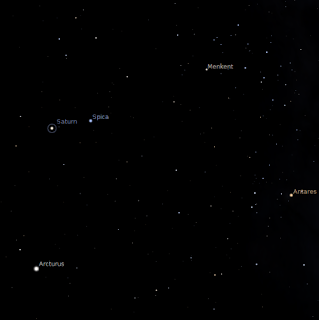 On the 9th, Venus is very close to the Asteroid Vesta (see printable PDF map here). Vesta is quite faint (magnitude 7), so you need binoculars and may need to watch over a number of nights to make sure you are seeing it (and the same considerations for the clusters apply to Vesta). Left Panel: The Kepler-11 solar system, 6 confirmed planets orbiting around a sun-like star, all within what would be the orbit of Venus. Right Panel: Kepler-11c transit as seen from Kepler-11d, with 11B about to transit next. 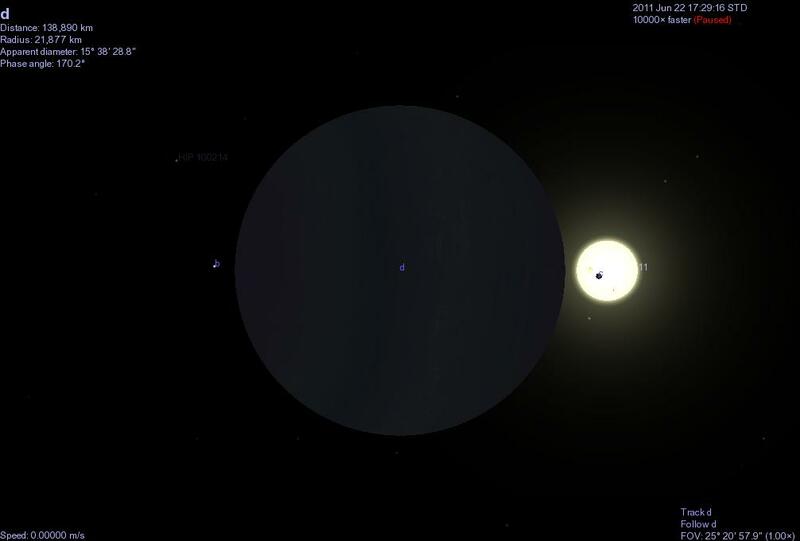 Kepler-11 system visualized in Celestia (click to embiggen). 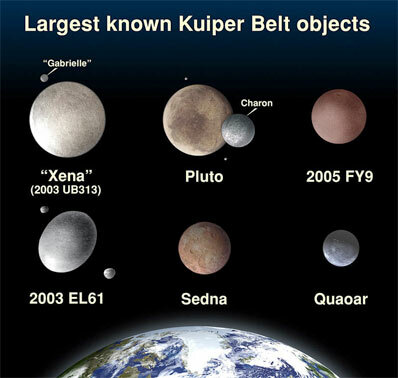 The Kepler spacecraft has been really busy. Hot on the heels of the magma world Kepler-10b comes a very different solar system, Kepler-11. Kepler 11 is a multi-planet solar system, with 6 confirmed planets it ties with HD 10180 the biggest solar system known to date ( HD may have a 7th planet, but it is currently unconfirmed, Gliese 581 may have 6 planets, but two of the planets are currently unconfirmed). However, this solar system is unlike that of ours. Kepler-11 is a Sun-like G class star, around the same size and luminosity as our Sun. However, its stable of detected planets all huddle well inside the equivalent of the orbit of Venus. They zip around their central star in a handful of days, and the two innermost are quite close to each other. 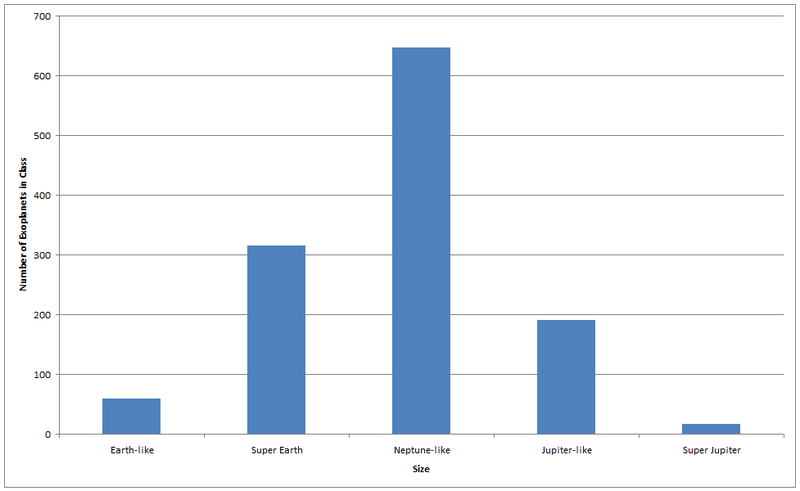 Of the 6, 4 are Neptune-like and two, b and f, are most likely water worlds (boiling water in the case of b). Multi-planet systems are rather rare, of the 521 planetary systems found by transit and radial velocity measurements, only 59 are multiple planetary systems. This is most likely an artifact of how we discover exoplanets; small planets are hard to find against a background of big planets, as are planets with long orbital periods. Also, with transiting planets the system has to be in the right orientation to have the outer planets observably transit. Of course, you can visualize this system in Celestia. First you need to create a file in the extras folder that has the star Kepler-11 in it (see the Kepler-10b post), I've already created one, and you can download newextrasolar.stc here, then copy into the Celestia extras folder. Then you need the file the sets out the exoplanets (Kepler11abcdef.ssc, download it here and copy into the extras folder), and Robert is your avuncular relative. So download the files and have a play. (I'll post about the 1200 planets Kepler has found, and the Earth-like ones, tomorrow). For a cartoon that will give you a bit of an uplifting chuckle, of relevance to the recent Astrology kerfuffle, click here (warning, things going BOOOM in space). And what is with the pie? ... that there have been no reports of death or serious injury after cyclone Yasi despite widespread devastation. Even though the storm has moved far inland, it is still rated as a category 1 cyclone, and is still quite dangerous. Spare a thought for the people of Northern Queensland, and donate to the Disaster Relief Appeal if you can. As I mentioned earlier, the Earth-orbiting Solar Sail NanoSail-D can be glimpsed in our skies as a fairly dim object. But NanoSail-D's highly reflective solar sail can catch the Sun's rays and the satellite appear to flare brilliantly. Unfortunately, the timing of the flares can't be predicted, as the orientation of the sail is not known well enough. However, they may be more likely when the satellite is near the horizon. The good news is that NASA and Spaceweather.com are staging a photo contest. After the terrible floods, cyclone Yasi has been upgraded to category 5, and is set to batter the coast today. Let's hope that lives are spared this time. If anyone is passing the local newsagent and happens to spot a copy of the February/March Australian Sky and Telescope, then there is an article in there by me about finding Mercury's sodium tail. The New Moon is Thursday February 3. Jupiter is easily seen in the early evening sky. 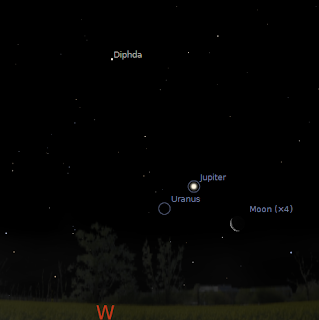 The moon visits Jupiter on February 7. 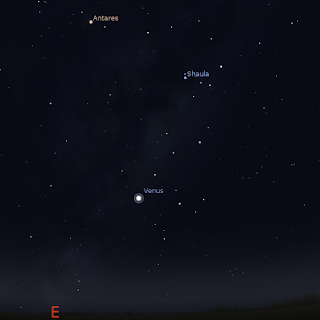 Venus is visible in the morning sky not far from the bright star Antares with Mercury below. Venus comes close to some bright deep sky objects on February 5 and Mercury is harder to observe. Saturn is well placed for telescopic observation. Bright white Venus is readily seen in the early morning sky below the bright red star Antares. just above the lid of the "Teapot" of Saggitarius. 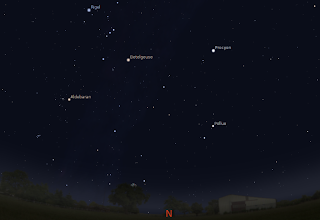 Venus, Antares and Mercury form a line in the morning sky at the beginning of the week. Venus is now in "First quarter" phase and will progressively decrease in size and wax towards "gibbous" over the coming weeks. 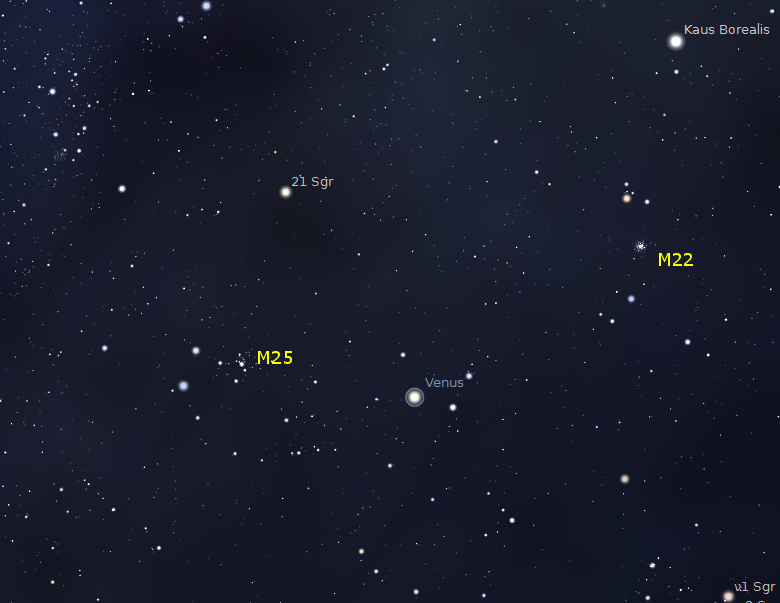 On the morning of Saturday February 5 Venus passes between the classic cluster M23 and the Triffid nebula M20. This will look very nice in binoculars in the early morning before twilight starts. 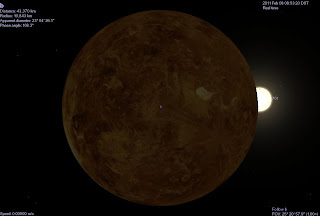 Mercury is visible in the morning sky below Venus. You will need a fairly clear, level horizon to see Mercury at its best and it becomes progressively more difficult to see during the week. Morning sky on February 5 looking north-east as seen from Adelaide at 5:30 am daylight saving time in South Australia showing Saturn near Spica. Similar views will be seen elsewhere at the equivalent local time. Click to embiggen. Saturn, is high enough for telescopic observation in the early morning. 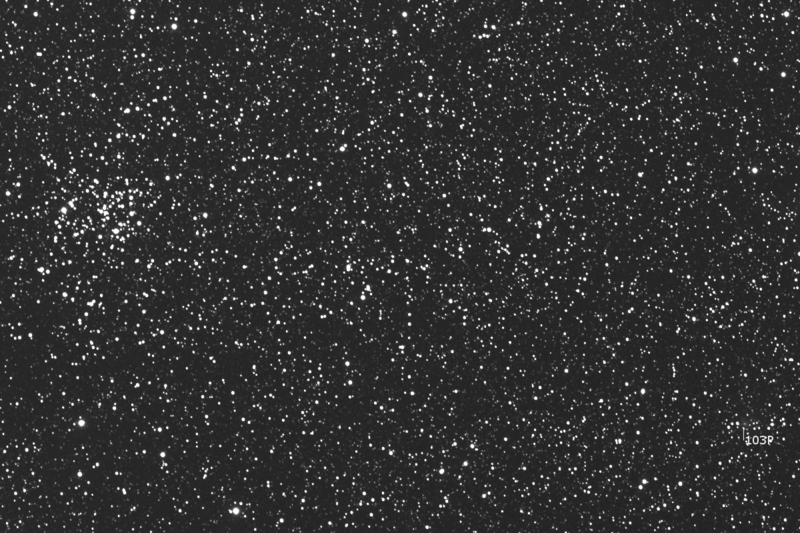 It readily visible above the northern horizon, not far from the bright star Spica. You might be able too see the big storm on Saturn if your telescope is big enough. Even in small telescopes you can see Saturn's moon Titan. Over the week Titan draws close to Saturn. Evening sky looking west showing Jupiter and Uranus at 9:00 pm local daylight saving time on Monday February 7. Click to embiggen. On the evening of Monday February 7, the crescent Moon is near Jupiter.